For patients having problems wearing complete or partial denture(s) and are looking to take the next step in securing their denture with dental implants, we offer comprehensive denture implant solutions. 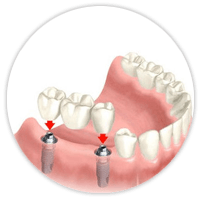 A dental implant is a small titanium screw that is placed in the jawbone where natural teeth have been lost. They act as a secure anchor for one or more artificial teeth, such as a denture or bridge. In cases where several or all teeth are being replaced, it is not necessary to have an implant to replace each missing tooth. 4-6 implants per arch (depending on mouth size) can secure an entire denture or bridge. Anyone healthy enough to undergo a routine tooth extraction can get an implant. Please call us for an implant consultation or to get more information about this life changing treatment. They can replace 1 or more teeth without affecting other adjacent teeth. They can provide support for a denture making it more secure than you ever thought possible. They can make chewing and wearing dentures very comfortable. 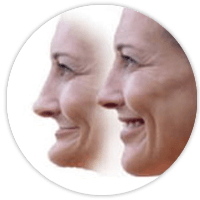 They can slow the facial aging process by preserving your jaw bone. Implant treatment has advanced greatly over the years resulting in more accurate implant placements, higher safety levels and less implant failures. Dentures over implants have now become standard of care in denture treatment. As part of our team, the dental professionals who place your implants have at their disposal the most sophisticated and accurate computer aided implant software and tools. With the use of a non-invasive 20 second CT Scan (sophisticated x-ray), they can increase the accuracy of the procedure and possibly minimize postoperative discomfort and make the entire treatment more predictable. Natural teeth are attached to our jawbone. As long as there is no periodontal disease/diabetes or any destructive dental conditions present the jawbone can be expected to remain healthy and intact. When natural teeth are removed, the bone inevitably undergoes resorption. 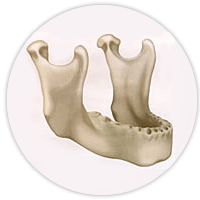 This loss of bone makes the wearing of complete and partial regular dentures more and more difficult as we age. The bone shrinkage is more rapid when the teeth are first extracted and slows to a gradual but ongoing pace for the rest of our life. Bone shrinks at different rates and different amounts for everyone but the end result for denture wearers is dentures that slip and move. 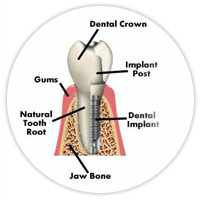 Dental implants replace the roots of extracted teeth and help stimulate and preserve the jawbone thus avoiding the sunken aged appearance that inevitably follows bone loss. Implants can help prevent bone shrinkage and help secure dentures from slipping and moving in your mouth. As the name implies, these implant dentures are patient removable. This allows the patient to easily clean the implants and the denture. The two main types are: Locator/Ball Attachment Implant Dentures and Bar Retained Implant Dentures. 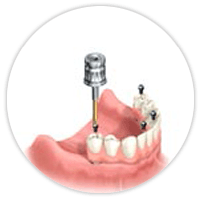 Each implant placed in the jaw bone has a small, gold, locator/ball (male) attachment secured to it. This locator/ball attachment snaps into a corresponding female attachment which is secured to the underside of the denture. 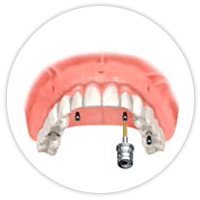 When the patient seats the denture in his/her mouth it snaps securely onto the locator/ball attachment. The implants placed in the jawbone have a thin fence-like bar secured to them, splinting the implants together. When the denture is made, clips are incorporated into the underside of the denture. When the patient seats the denture in the mouth onto the bar, the clips clamp onto the bar and secure the denture firmly in place. This treatment tends to be more supportive as the bar is taking some of the chewing load. The Conus Denture is an implant retained denture requiring as few as 4 implants. It is currently being presented to patients as a fixed denture due to its’ tight fit but IS removable by the patient. It is this dual benefit which makes this prosthetic option unique and very attractive to denture wearers. Not only can patients have the maximum retentive benefits of a fixed denture (bridge) but they can also remove it for superior cleaning. 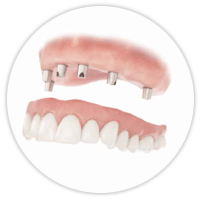 The Conus Denture utilizes custom milled abutments (tiny metal towers) secured to your implants. The denture then sits upon the towers and tightly friction fits to them, the stronger the bite pressure the more secure the denture. Fixed implant prosthesis are as the name implies, fixed to the dental implants. The patient cannot remove them making them more like natural teeth. Within this category are single tooth, multiple tooth, and full fixed denture replacement. 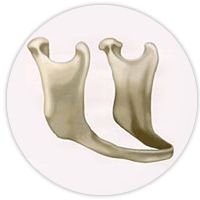 Fixed prosthesis are usually the most desirable implant treatment, however depending on the individuals situation they may or may not be indicated. When two or more teeth are missing side by side in either the posterior or anterior of the mouth, a fixed implant bridge can be placed. The Dentist or Oral surgeon first places the implants and they are allowed to “bond” with your jawbone for approximately 3-6 months. 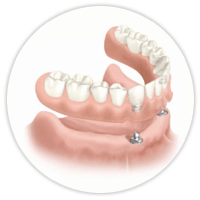 Once this occurs we can then fabricate the bridge to match your surrounding natural teeth and fix it to the implants, thus eliminating the need for a bulky removable partial denture. When all remaining teeth are missing in either the upper or lower arch 4-6 implants can be placed (depending on the jawbone size) and a very special denture can be made which is fixed to the implants. This is the most secure and comfortable denture a patient can have. Home cleaning and hygiene of this prosthesis is similar to natural teeth by brushing, flossing and using a water-pik. By combining several implant technologies our team can now offer our patients permanent, fixed dentures faster than conventional denture implant treatment. For patients who are candidates, this treatment allows us to place 4 implants and secure a permanent denture all in the same day. Patients suffering with uncomfortable and painful dentures now have a clinically proven, FDA approved treatment option for replacing missing or non-functional teeth in just one day. No more slipping dentures, sore spots or denture adhesive! 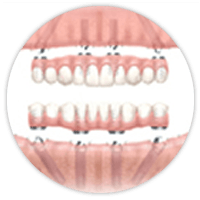 The All-On-4 (AO4)® technique is specifically designed for people missing all their teeth either on the upper/lower or both arches. AO4® qualified patients receive 4 implants and a fixed denture/bridge. How quickly implants and permanent dentures/bridge are successfully and accurately placed. How affordable they can be in comparison to other implant treatments. How quickly your quality of life improves. Unlike other approaches which can use 6-8 implants per arch and involve bone grafting, the AO4® technique involves placing 4 specially and specifically placed implants with the aid of sophisticated computer technology developed by Nobel Biocare. Fewer implants are placed without bone grafts, meaning lower costs and reduced healing time for you.